Sony Mobile Flasher is a small Windows utility tool that lets you flash stock or custom ROM firmware files on Sony smartphones and tablets. Download Sony Mobile Flasher from here, install it on your computer and flash firmware on your Sony device easily. Although this is a third party tool, it functions effectively well and helps Sony users to flash the firmware on their devices. Here we have managed to provide all versions of this tool. 1) Flash stock/custom Firmware: Using this tool, you can easily flash stock or custom firmware on your Sony device. To flash the firmware using this tool, all you have to do is load the firmware and click on the “Flash” button. 2) Root your Sony device: The other main features of this tool is that it allows you to root your Sony smartphone or tablet by installing the SuperSU root management application. 3) Flash stock and custom recovery: Sony Mobile Flasher also lets you flash stock and custom recovery on your Sony device. 4) Flash busybox and custom kernels: You can also use this tool to flash busybox and custom kernels on your Sony smartphones and tablets. 5) Compatible with Mac, Linux and Windows: You can use this tool on computers with Windows, Mac or Linux operating system thus making it one of the popular flash tools among Sony Android device users. 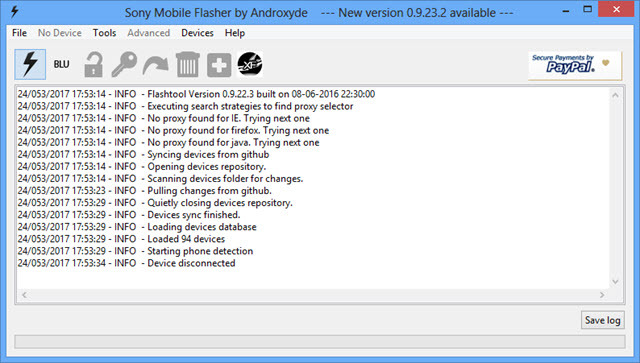 1) Androxyde creates Sony Mobile Flasher. So all credits must go to the developer. 2) This flash tool is compatible with Windows, Mac, and Linux operating system. 3) Download Sony Xperia USB driver and install it on your computer, so that you can connect your Sony device to PC or Laptop computer. 4) Using this tool, you can sync your Sony device to a computer. Sony PC companion lets you do the same.